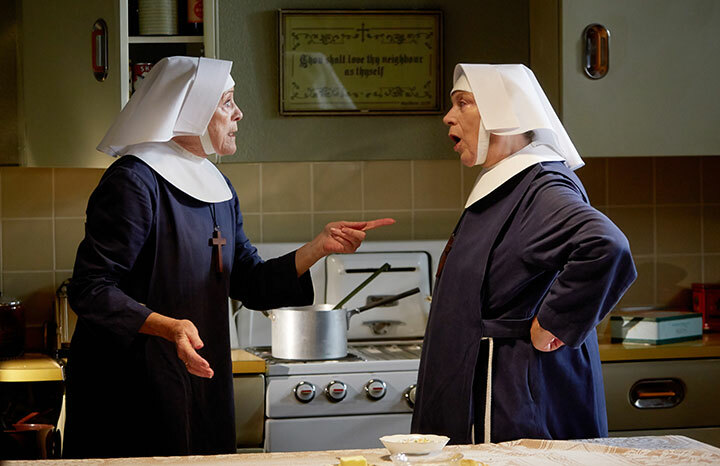 Sister Evangelina's death on Call the Midwife - played marvellously by Pam Ferris - left not a dry eye in the country. Now, Pam has revealed that real reason she had to leave the show was because of her beloved dogs. "We filmed the first couple of series of Call the Midwife in north London and that was a do-able train commute from my home in East Kent, although it still meant very early mornings and not getting home until eight or nine at night. Pam adores dogs and didn’t have to think twice when Blue Cross asked her to become an Ambassador for them. She became involved with Blue Cross some years ago, after seeing them featured on the TV programme, Pet Rescue. “Do you remember that show?” she asks. “It highlighted animals and pets who needed homes. We had one Jack Russell at the time and we wanted a companion for him. Two elderly female dogs were shown – one was a Corgi/Jack Russell cross and the other was a funny little Yorkie. They were tea-and-biscuit dogs, lapdogs, and both had been abandoned. They were sitting in a cage and looking forlorn as if to say, ‘What have we done wrong?’ They were both about 11. "We thought we’d be able to give them three or four years of happy life. We drove to Burford in Oxfordshire, Blue Cross HQ, and met the dogs. Then there was a home visit to see if we were suitable and happily we were. It turned out that Sophie, the Corgi/Jack Russell cross was nearer eight than 11 – she’d appeared older because she was so unfit and depressed. But once she was with us, she lived for another nine years. And do they get on? “Yes – although she likes to put her head in his mouth on a daily basis,” Pam laughs. In her role as Ambassador of Blue Cross, Pam has visited their hospital for pets in London’s Victoria. “The staff do an incredible job for minimal costs – there is no official funding, the charity relies entirely on donations,” she says. “Vet fees can be so expensive and many people can’t afford them. But why should they be deprived of the company, love and companionship of their pets because they can’t afford the bills? In the last series of Call the Midwife Pam starred in, her character Sister Evangelina struggle to cope after suffering a stroke and losing movement in her right arm. She said she could no longer work as a midwife.